Alphabet's added fiber capacity will benefit not only Google Cloud Platform, but YouTube and other Google properties as well. When Azure announced on Monday that it had opened two new Availability Zones in Australia, it was quick to point out that no other global public cloud was offering more than a single location in the land down under. That doesn't mean other cloud providers don't have an eye on the land of Oz, however. After banking hours on Tuesday, Google announced it's bringing more undersea fiber to both Australia and Japan with an investment in the Japan-Guam-Australia (JGA) Cable System. The system, which will link Australia and Japan by way of Guam, is only one of many undersea fiber projects underway in the Asia Pacific region in which Google has invested. Expected to go online this summer is the Pacific Light Cable Network (PLCN), a joint effort that includes Facebook and China Soft Power Technology Holdings subsidiary Pacific Light Data Communication. When completed, the project will link Los Angeles and Hong Kong. It will also be super fast, with a speed of 120 terabits per second, besting the current record holder, Faster, another trans-Pacific cable with Google involvement that links Oregon with Japan and Taiwan. Faster came online in 2016. Debuting in 2019 will be the HK-G cable, which will link Hong Kong with Guam. Google is working with RTI-C and NEC on this project. Also expected to be completed in 2019 is INDIGO, which will connect Singapore, Indonesia, and Australia. Google is partnering with AARNet, Indosat Ooredoo, Singtel, SubPartners, and Telstra on this system, which is actually two distinct projects. Indigo West will connect Singapore to Perth via Jakarta, with Indigo Central connecting Perth to Sydney. In a statement about JGA, Google said, "This new addition to the Google submarine network family, combined with investments in the Indigo, HK-G and SJC subsea cables, will give GCP users access to scalable, diverse capacity on the lowest latency routes via a constellation of cables forming a ring between the key markets of Hong Kong, Australia, and Singapore. Our investment in these cables builds on our other APAC cable systems, namely Unity, Faster and PLCN, interconnecting the United States with Japan, Taiwan and Hong Kong." JGA will have two fiber pairs connecting Japan to Guam and two pairs connecting Guam to Sydney, stretching a combined distance of nearly 6,000 miles. The project is being co-built by NEC and Alcatel Submarine Networks. Similar to INDIGO, it's being built in two segments. 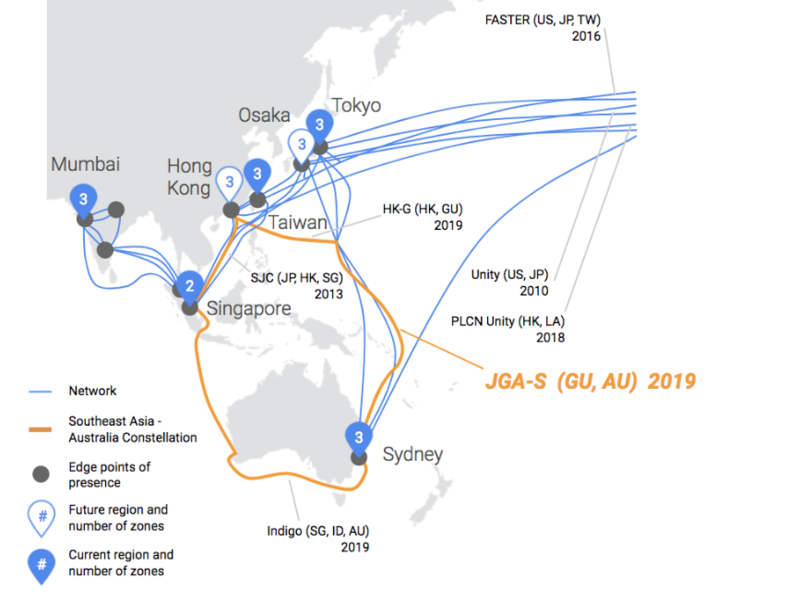 The JGA-South segment is being developed by a consortium of AARnet, Google, and RTI-C, while the JGA-North segment is a private cable being developed by RTI-C.
"Taken together, these cable investments provide improved connectivity to GCP’s five cloud regions across Asia and Australia (with more on the way), so that companies using GCP can serve their customers no matter where they are," Google added. "Whether we’re delivering directions to Maps users, videos to YouTube viewers, or GCP services to businesses, we know a fast and reliable infrastructure makes all the difference."